Let us help you connect with nature… right in your own backyard! The Grange has a full selection of delicious (at least the squirrels say so!) seed blends and quality feeders to turn your backyard into a wild bird haven! Our bird seed selections include waste free formulas to keep your yard cleaner, mixes that will attract a variety of bird species and a full selection of suet. Speaking of those squirrels… we’ve found that the best way to prevent them from eating all your bird seed is to provide them with their own feeding area! That’s why we found the best squirrel enticing blends and special feeders designed just for squirrels. Our wild bird room wouldn’t be complete without a special section devoted to hummingbirds. 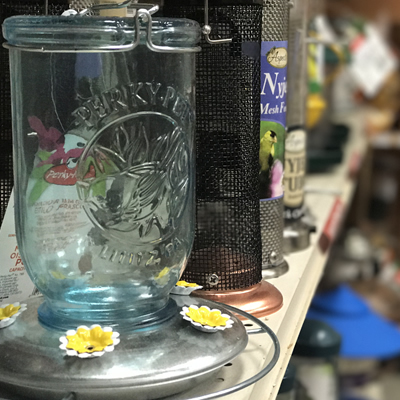 Our traditional feeders come in a range of sizes… so your birds will never run out of nectar! A visit to The Grange wild bird room will surely add some life and color to your backyard!